How public opinion monitoring applies to election campaigns? 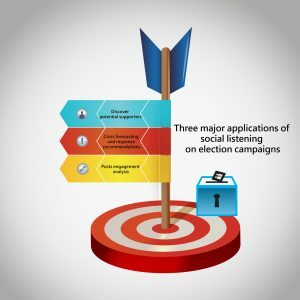 How public opinion monitoring by Social Listening applies to election campaigns? How Social Big Data can make or break election campaigns? The day before the 2016 US presidential election, most polls showed Hillary Clinton as the winner, and Trump’s election was a big surprise. Among the many political forecasts, the artificial intelligence system MoglA stood alone in successfully predicting a Trump win based on the data collected from more than 20 million data points on Google, Facebook, YouTube and Twitter. It demonstrated that social big data analysis is crucial to electoral campaigns today. Among the many political forecasts, the artificial intelligence system MoglA stood alone in successfully predicting a Trump win based on the data collected from more than 20 million data points on Google, Facebook, YouTube and Twitter. It demonstrated that social big data analysis is crucial to electoral campaigns today. Politics is something for all, and social media nowadays is just where people express their thoughts about and interactions on different things. Political elections have always had to find ways to communicate with and please voters. For example, we can create a better image and disseminate ideas for candidates through advertising, street speeches, and connect with voters. Today, through social big data, human behavior and ideas can be carefully and concretely grasped and analyzed. Can we deny that this “virtual place” is where elections are currently contested? In political elections, opinion polls have always played an important and instrumental role at different stages that affect voters’ decisions and candidates’ strategies. 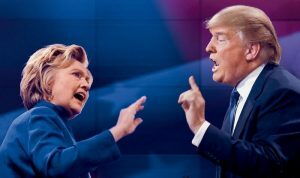 In the era of big data, traditional polls alone are not enough to provide a convincing and comprehensive analysis. We must combine them with social big data to draw more accurate analysis of voter sentiments. The main difference between traditional polls and social big data is between the activeness and passiveness. In traditional polls, information is gathered by interviewing respondents actively, via questionnaires conducted over the telephone and online. These methods provide questions and answer options to respondents and rely on their responses for intention analysis. On the other hand, social big data passively accesses and monitors the open and interactive behavior of users on social media platforms to interpret their true intentions. If the pros and cons of the two polling methods are compared in terms of accuracy, in fact, both have their own unique strengths and limitations. Therefore, the two should complement each other to offer a better forecast. The sampling accuracy and data authenticity of the traditional polls are relatively low, obstacles that are difficult to overcome. From a statistical point of view, as long as respondents’ characteristics are consistent with the overall research targets set by the survey, a certain number of respondents can summarize the intent as a whole. However, there are a large number of different sample-oriented features, such as gender, income, educational level, age, living area and so on. When the sample features are more diverse, the chance of errors in analysis is greater. Even if the sampling is accurate, the authenticity of the data cannot be easily solved because traditional polls assume all the data is real, but indeed respondents’ answers may include counter-talk, lies and refusals, all of which are not analyzed. Other factors, such as the position of the visiting agency, the interviewer’s questioning method, etc., will also affect the authenticity of the respondents’ answers. Social big data can make up for the limitations in sampling accuracy and data authenticity of traditional polls. Using social big data as a poll, collecting large amounts of sample data and tracking respondents’ online community behavior over a certain period of time, can help solve the problem of insufficient sampling and data accuracy. However, the distribution of users on online platforms may not represent the whole society, and most of them are young people. Moreover, the answers collected by the passive monitoring of big data are usually as not as clear as those gathered from traditional questionnaires. Thus, the final data analysis may unavoidably raise concerns about representation and ambiguity. Therefore, to adopt traditional polls and social big data analysis at the same time would be the best choice to maximize the merits of both and compensate for their flaws. This combination would make future public opinion polls more representative of the real situation. Traditional qualitative research methods can help us understand the significance of social big data, and big data can add to the traditional research with interactive behavioral data generated on the internet, enabling us to fully understand the true intentions of respondents. Social listening is able to analyze public opinions towards different political issues and voters’ intention on the during different phases through voters’ footprints on social media. During election campaigns, the situation changes rapidly. Each campaign team also hopes to grasp voters’ perceptions at different stages. Social listening is able to analyze public opinions towards different political issues and voters’ intention on the during different phases through voters’ footprints on social media. In the past, election teams would ride on the historical records of voting results and vote distribution of the polling stations to estimate the supporters of candidates and to set a strategy of consolidating or developing their vote base. With the help of social listening, a campaign team will now be able to figure out potential supporters who have not expressed their opinion previously, get in touch with them through topics they are concerned about and mobilize them in the virtual world to come out and vote. In the 2014 Taipei mayoral election, Ko Wen-je, based on the recommendation of his social big data analytical team that there was a significant correlation between “youth” and “street dance”, began visiting the dance activities in person and actively engaged with participants. A video of his visit went viral on social media. Behind Ko’s strategy was the belief that if an issue could attract more than 5,000 people, then 20 such posts could affect the voting decision of nearly 100,000 people. Focusing on the most vulnerable “political cold-blooded” community enhanced his chances of winning the election. The operation of a social media fan page is an important part of the today’s election campaigns. A good fan page can enhance interaction with the public and generate a higher level of communication for candidates, but the quality of the content of the posts is critical. Taking the 2016 Taiwan presidential election as an example, on Tsai Ing-wen’s Facebook fan page, posts were diverse. In addition to her policy platforms and campaign announcements, there were daily photographs of Tsai Ing-wen interacting with the masses as well as infographics and cartoons. With photos and videos as the major post types, and by strictly following the trend of supplementing text with pictures or graphics, the likes and share rate of her fan page was the highest among the candidates. Social listening can collect and analyze the response of the public to a candidate’s posts, thus proposing amendments to the content to attract more voters via online platforms. During an election campaign, attacks on candidates can devastate their image in an instant. Therefore, it is critical to recognize the crisis early so that the team can prepare well and minimize the impact of the crisis. In terms of crisis management, social listening can analyze the frequency of negative voices and public opinion, so that the team can present the most comprehensive response and protect the candidate’s image at the most appropriate time. During the Taipei mayoral election in 2014, a crisis called “MG149” broke out. Someone fiercely attacked Ko Wen-je, alleging that he had set aside private accounts in a hospital at NTU for alleged embezzlement, money laundering and tax evasion. At the time, Ko’s election team had been monitoring the daily popularity of the critics, articles related to the crisis, well-received keyword analysis results of the candidate. The team was able to put forward a very effective response strategy to quickly explain the matter to the public in detail, holding a press conference to clarify and so on. By so doing, they successfully reduced the voices of objection from 80% to 10%. In the era in which everyone has a smartphone on hand and can access social media anytime anywhere, voters’ opinions on politicians and political issues have also accelerated, continuously creating changes and new challenges. To closely track the personal feelings of voters through social media is now the trend, and can even make or break future elections.